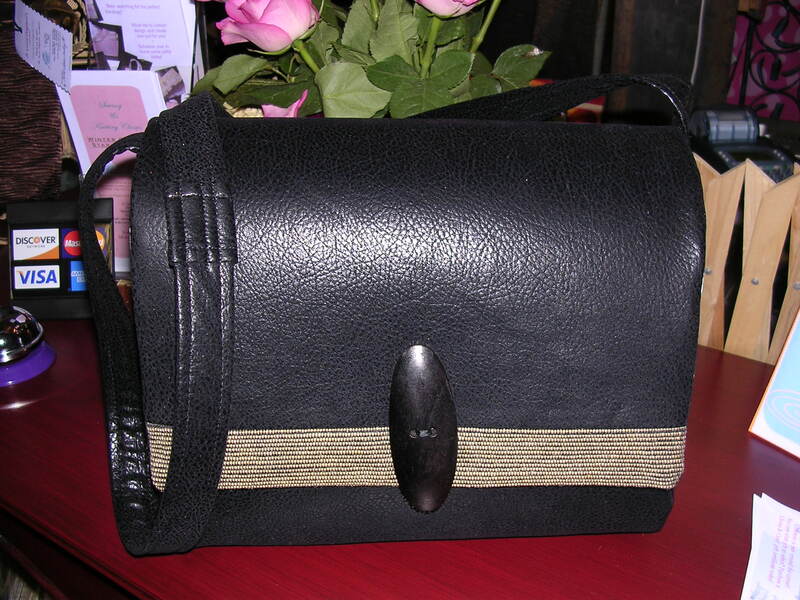 From Totes to Special Occassion handbags, each designed with care and fabric selection. Made from silk, taffeta, organdy, faux sued, leather or upholstery fabric. 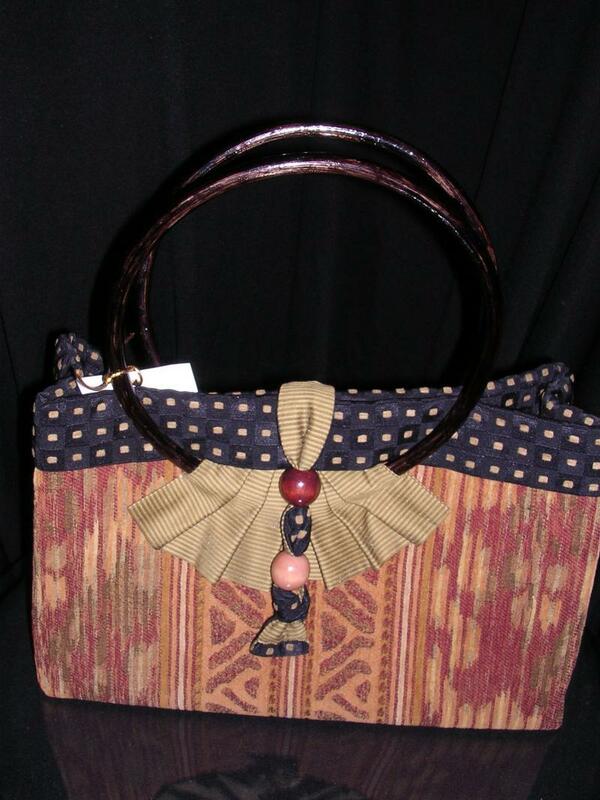 Some hand beaded with glass beads all with linings that are as beautiful as the purse itself. All conscientiously made with you in mind and finished with dress maker details. Local to the Meriden, Ct area? 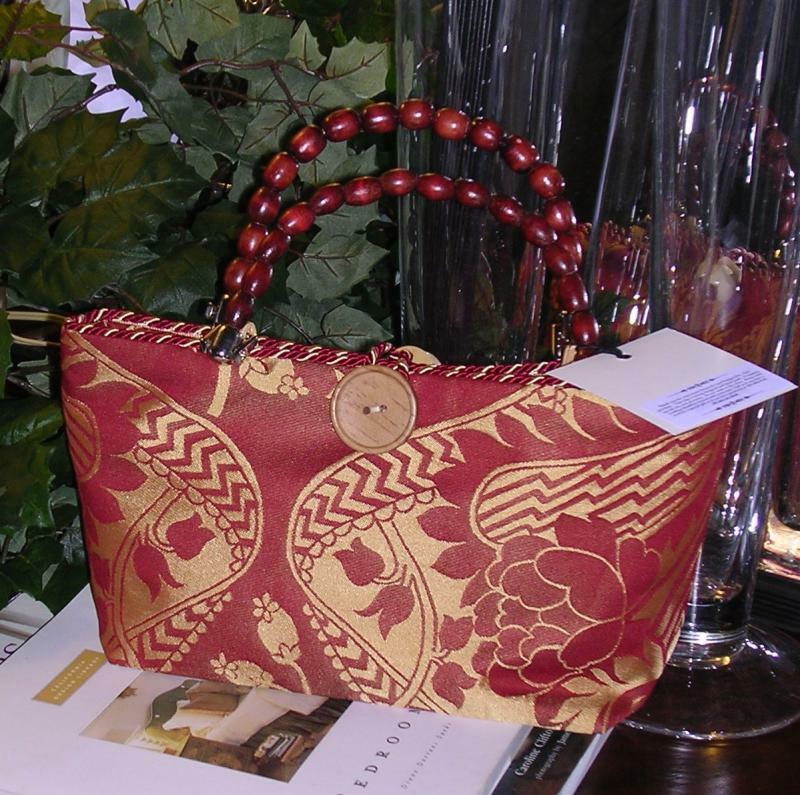 Why not consider having a "Cleona & Carol Designs Purse Party" and invite your friends and family? It will be fun and as the host you'll earn reward towards the purchase of your purse and accessories. 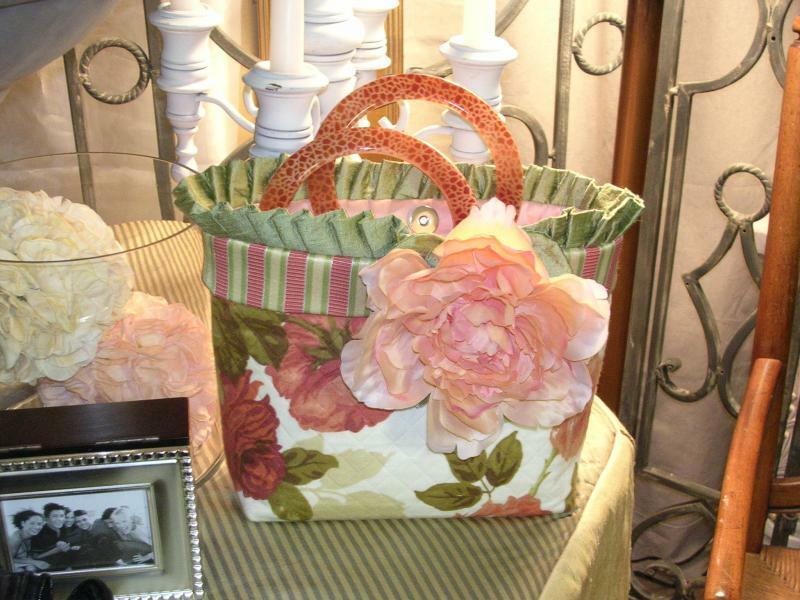 We make our mini totes from an array of fabric remnants and embellish them with silk flowers or buttons and beads. You be the designer and tell us what colors and textures you like and we'll do the rest. 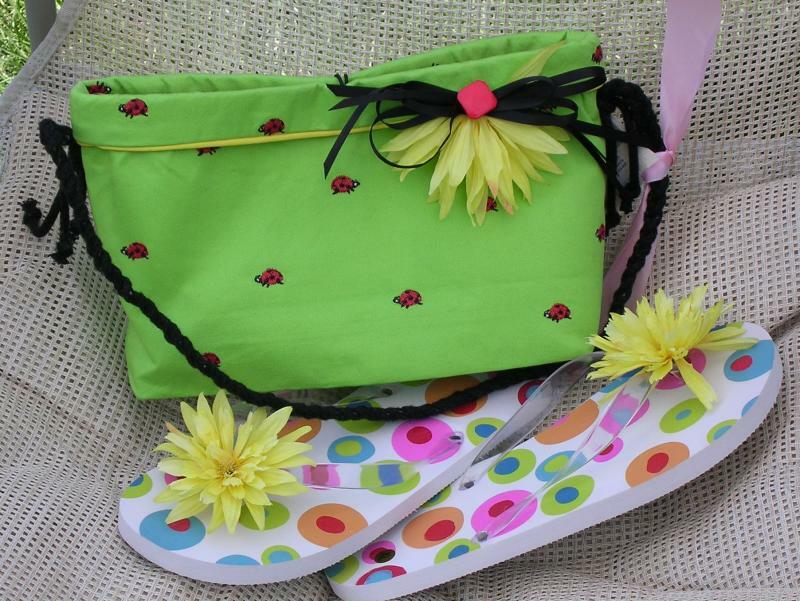 What about a bright green soft Mini-Tote with mini red/Black Lady Bugs! Totes: Reqtangular - From 14"-12" x 10" x 4". Fully lined with inside pocket. Prices from $55 - $100. Some accessories sold separately. Going to a beach or outdoor party? 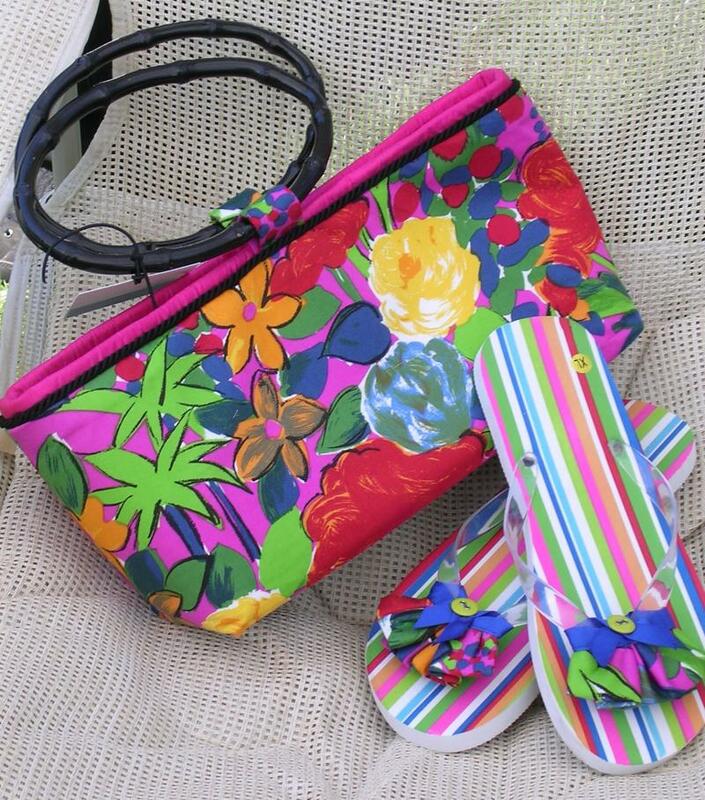 Take along with you this cute, brightly colored Midi-tote and wear the matching embellished Flip-Flops. Add a matching fabric covered headband or hair clip. 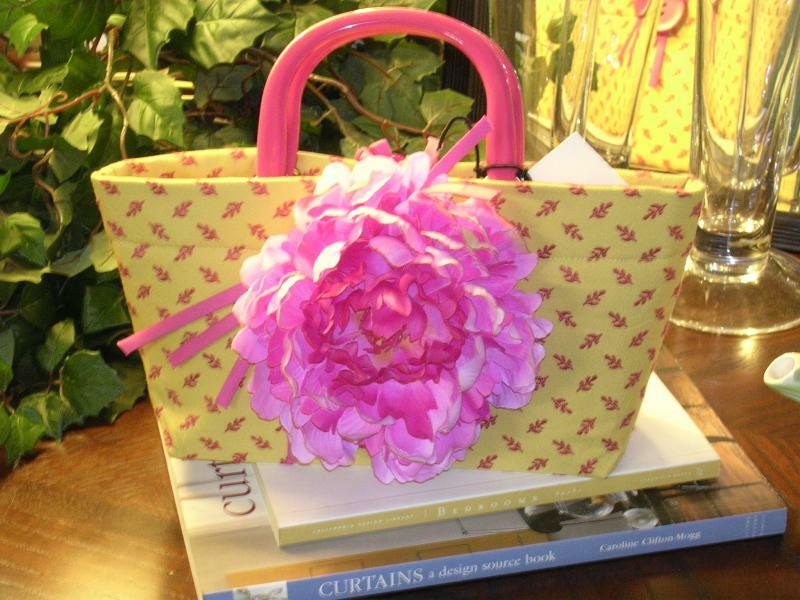 Tote is fully lined in bright hot pink satin, edged with black satin cording and finished with black oval bamboo handles. No pocket. This bag sold with Flip-Flops as set. Matching headband or hair clip, extra. Sample maxi tote. 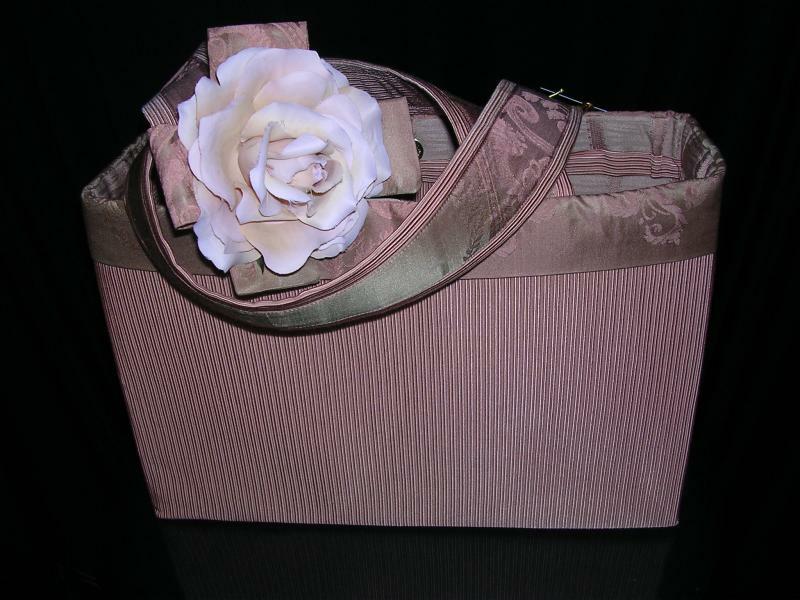 This version includes silk trim and detachable ivory silk rose pin. 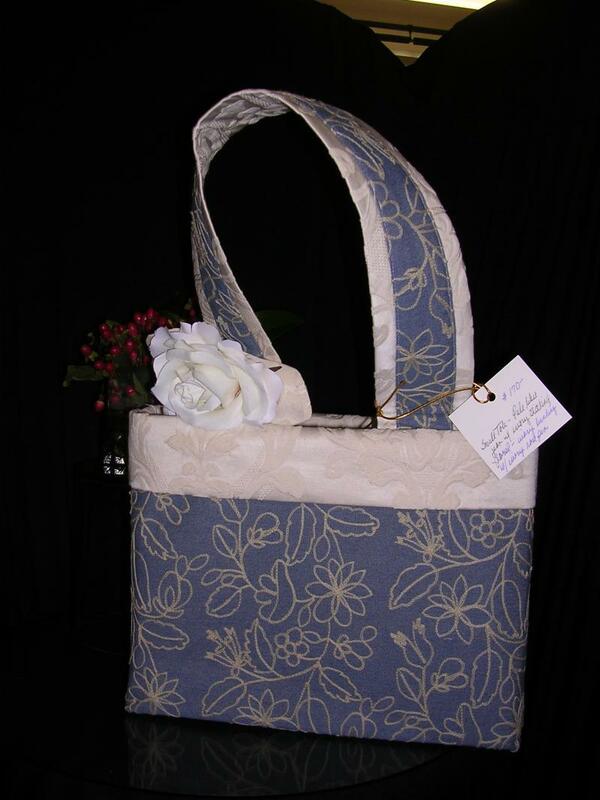 Sample denim maxi tote with ivory trim and silk rose detachable pin. 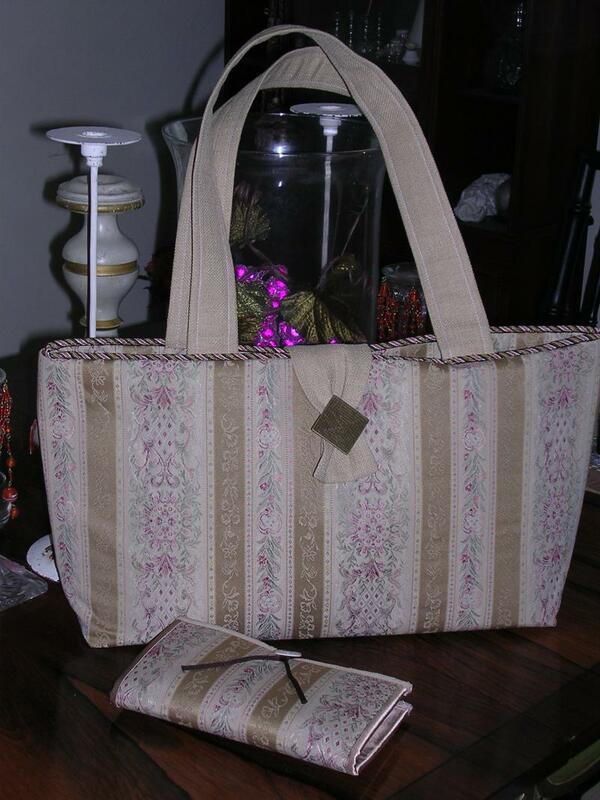 Sample damask maxi tote with linen handles and matching wallet. Tote structured and durable with magnetic closure and zippered pocket, includes 2 open pockets, sized to hold matching wallet, cell phone, pen and credit cards. Wallet is sized to hold credit cards checkbook, calculator and has a cash slot. Button closure. Sold as set. 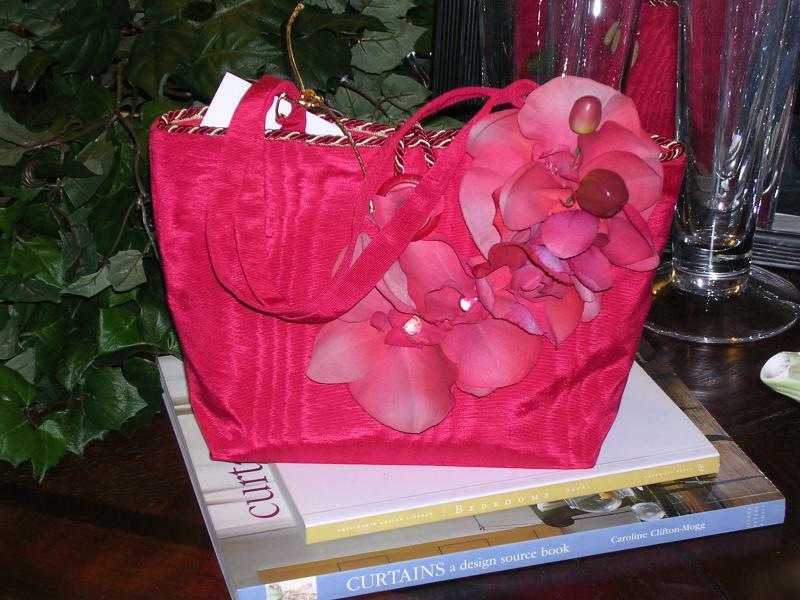 Clutch with detachable handle and red silk clip rose. Lined in red satin with magnetic closure. 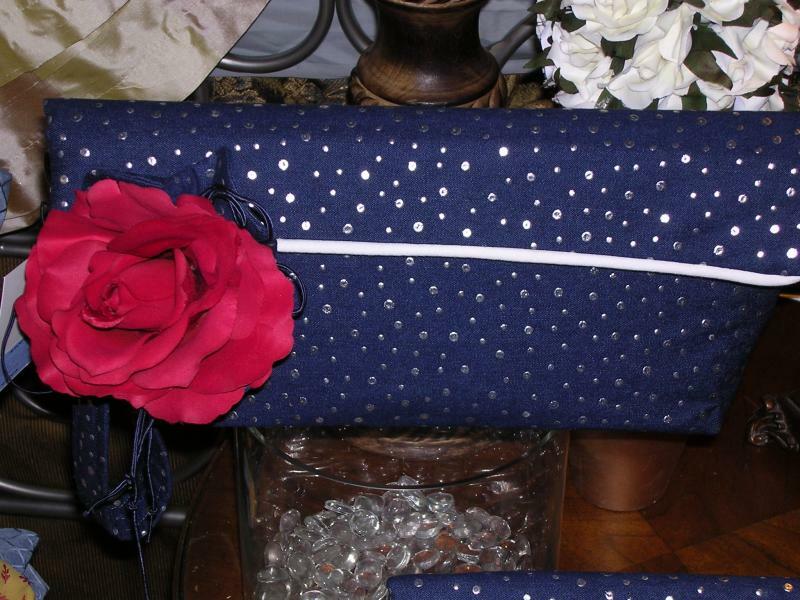 Made from dark blue jean fabric with silver metalic dots. Fancy Bags: Sizes vary. Price varies based on fabric and embellishments. 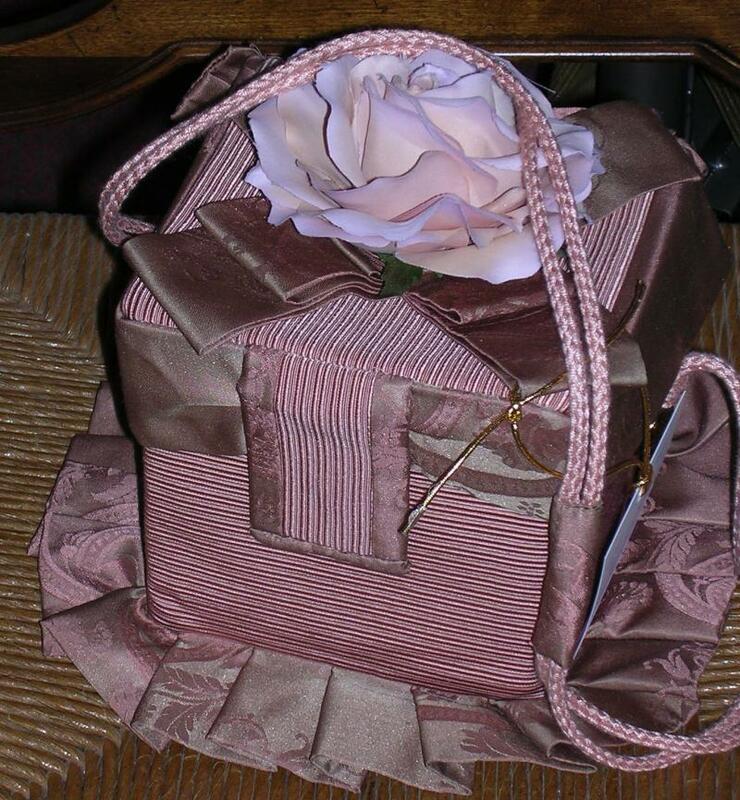 Made from choice fabrics and embelished with beads, silk flowers or jewlery. Please call for quote and selections. "Make yours custom!" You select size, fabric, color and handles. Call for quote and options. Nothing is too out of the ordinary for Cleona & Carol Designs Etc. Shimmery hot watermelon in overall color. This shimmery overlay on glimmery hot pink is the perfect accessory for a trip to the Bahama's. Lined in a hot colored plaid silk. We can also make this is a number of other colors. A trio of coordinating fabrics makes for a stunning small handbag. 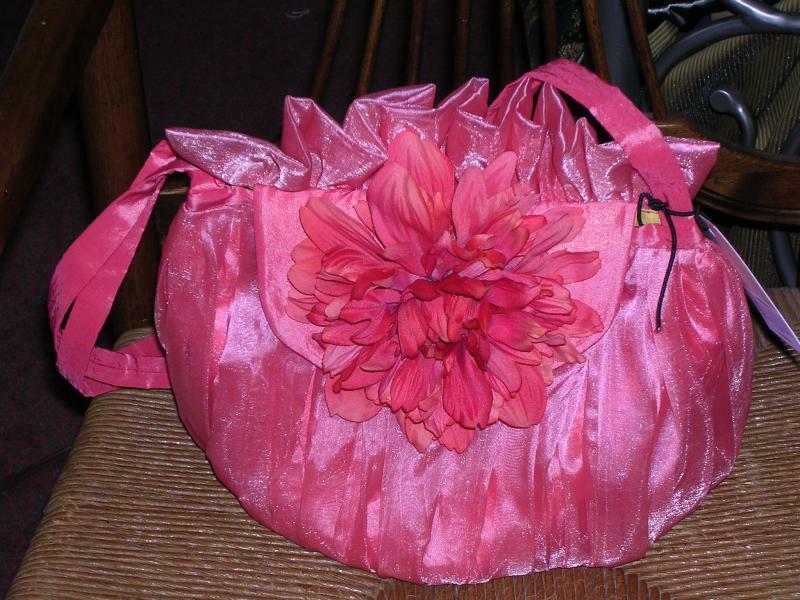 And with the attached peachy-pink silk blossom it make the perfect purse to go with your dress for the garden party or wedding. Yes, it's shaped like a gift box and that's why it's called the "Gift Box Bag". Perfect for taking that next step towards asking the "Big Question"! Lined in beautiful peach satin. Simply adorable! Teal w/bright green linen, lined in light teal satin with detachable ivory silk rose pin and rayon coordinated matching scarf. We will make a custom coordinated scarf, silk flower pin or clip. We'll also make wallets, coin purses and embellished Flip-Flops, slippers or sandles. You tell us what you want. We'll even use your own fabric. Please call or email us for a quote if you don't see what you are looking for. 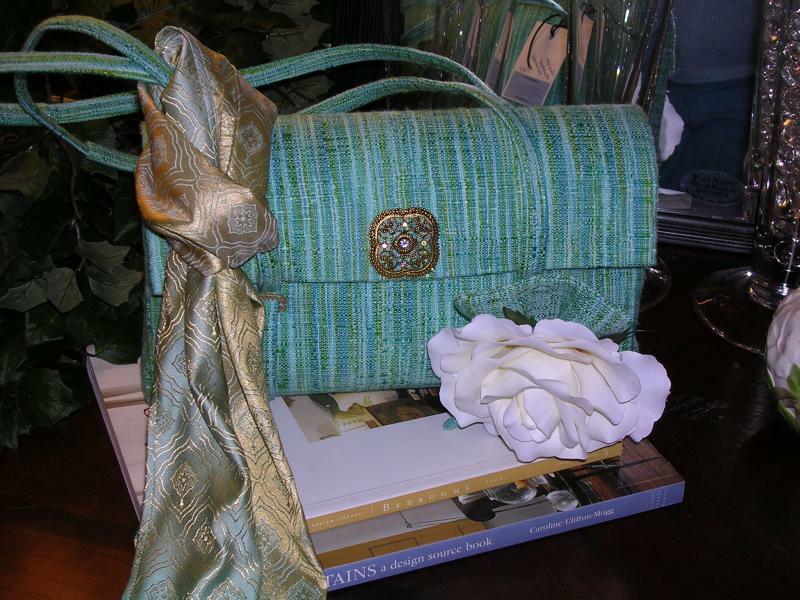 Due to the custom nature of our hand made purses, many are one-of-a-kind or are very limited in quantity. Place your orders early for best selection. Or we will make every effort to create something similar in nature. Our selection of merchandise is continually be updated for seasonal changes in addition to your feedback requesting special items. I encourage you to check back regularly. Click here to send us an email or to request a product.